Shell and the Brunei government are 50:50 shareholders in Brunei Shell Petroleum Company Sendirian Berhad (BSP). BSP holds long-term oil and gas concession rights onshore and offshore Brunei, and sells most of its natural gas production to Brunei LNG Sendirian Berhad (BLNG, Shell interest 25%). BLNG was the first LNG plant in the Asia-Pacific region, and sells most of its LNG on long-term contracts to customers in Asia. We are the operator for the Block A concession (Shell interest 53.9%), which is under exploration and development. We have a 35% interest in the Block B concession, where gas and condensate are produced from the Maharaja Lela Field. In addition, we have a 12.5% interest in exploration Block CA-2 under a PSC. We produce oil and gas located offshore Sabah and Sarawak under 19 PSCs, in which our interests range from 30% to 85%. In Sabah we operate four producing offshore oil fields with interests ranging from 50% to 80% as part of the 2011 North Sabah EOR PSC and SB1 PSC (the latter expired at the end of December 2012). We also have additional interests ranging from 30% to 50% in PSCs for the exploration and development of five deep-water blocks. These include the unitised Gumusut-Kakap deep-water field (Shell interest 33%) and the Malikai field (Shell interest 35%). Both these fields are currently being developed with Shell as the operator. 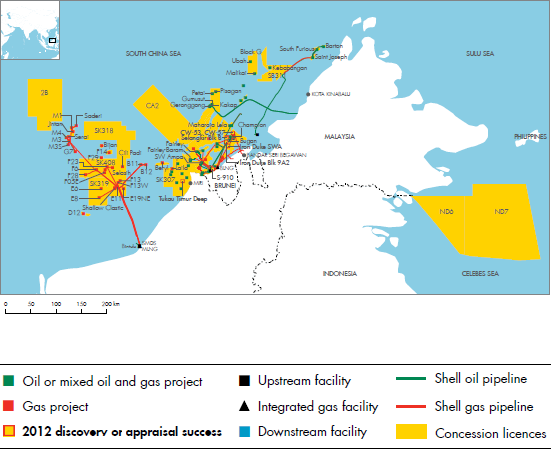 In Sarawak we are the operator of 20 gas fields with interests ranging from 37.5% to 70%. Nearly all of the gas produced is supplied to Malaysia LNG in Bintulu where we have a 15% interest in each of the Dua and Tiga LNG plants. We also have a 40% interest in the 2011 Baram Delta EOR PSC and a 50% interest in Block SK-307. In 2012, we signed five new exploration PSCs, deep-water blocks 2B, SK318, SK319 and SK408, all offshore Sarawak, and SB311, offshore Sabah. We also operate a GTL plant (Shell interest 72%), which is adjacent to the Malaysia LNG facilities in Bintulu. Using Shell technology, the plant converts natural gas into high-quality middle distillates, drilling fluids, waxes and other speciality products.